The Smokies can always be counted on for fulfilling the promise of spring renewal. One of the best spots for finding early blooms of exotic native wildflowers is on Porters Creek Trail in the Greenbrier section of the national park. Along the pathway is a diverse array of flowery goodness including the multi-acre mystical fringed phacelia garden, seemingly home to a host of woodland creatures like sprites and faeries. The dazzling display of Mother Nature’s finest has been a couple weeks early this year, due in large part to a very warm month of March. I visited Porters Creek on Thursday, March 24, 2016 expecting to be too soon for wildflowers, but hoping to avoid the massive crowds that descend on the magical garden in spring. To my delight, I got the best of both. As they say, the early bird catches the worm… and in this case some alone time with the fresh blossoms. It was a beautiful bluebird day, starting with perfect hiking temps in the mid-fifties. It only got better from there. Within the first 10 minutes I was treated to a pair of young does quietly crossing the trail 100 feet in front of me. Porters Creek was somewhat dry following a couple weeks without rain, a change from the roaring torrents during the very wet winter. 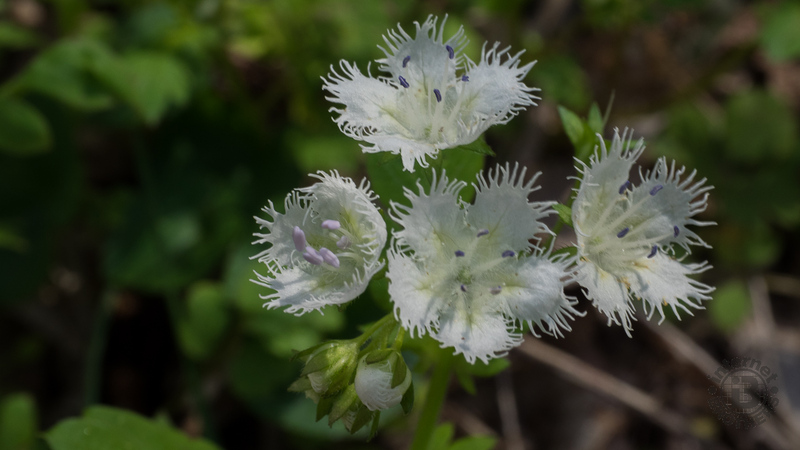 The flower of Fringed Phacelia makes its common name obvious – the five petals are deeply fringed. The lavender anthers can be quite striking. They tend to grow in large colonies, making mountain slopes look almost snow-covered at times like along Porters Creek in the Smokies. Fern Branch Falls also had a lower flow level than I have seen, so I explored more of the trail beyond the falls. Porters Creek Trail gets narrower and steeper as you continue up the drainage. Eventually the blooming wildflowers stopped as I reached higher elevation, but I feel certain this area before campsite 31 will catch up soon. There is a wealth of rhododendron along the upper trail, so expect a spectacular burst of color in mid-to-late June. All told the round trip trek is 6.4 miles. If you would like to hike Porters Creek Trail yourself, here is my trail report from 2015. I hope you enjoy these new photos from my visit to the Greenbrier region of Great Smoky Mountains National Park as much as I enjoyed the day. Please feel free to leave your comments below the gallery. Updated March 29, 2017: A trip to Porters Creek in late March has been permanently embedded in my brain’s long-term memory. It never disappoints. And so it was this time as well. The creek, the history, the wildflowers and the waterfall were just as incredible as they always are. I arrived at 8:00am and had the place nearly to myself on the way up to the falls. Different story on the way back as dozens and dozens marched their way from the cul-de-sac at the end of Greenbrier Road to witness all the bounty to be found at Porters Creek. But also on the way back, the sun rose above the surrounding mountain ridges and enlightened the fairyland, enabling even more wildflowers to spring forth in the weeks ahead. Below is a new gallery of photos from my 2017 visit. Click any thumbnail to scroll through the slideshow, then feel free to leave your comments at the bottom of the post. After you do that, hop in your car and get yourself to Porters Creek.